YOUR MAMAS NOTES: In December 2010 German supermodel turned reality tee-vee titan Heidi Klum (Project Runway) and Grammy-winning singer/songwriter Seal paid $14,200,000 for a 12,300 square foot Mediterranean mansion in the gated Brentwood Country Estates enclave in the Mandeville Canyon area of Los Angeles, so it was only a matter of time before they made an effort to unload their secluded Beverly Hills, CA estate. The couple's Bev Hills mansion, described in listing information as a "21st century Loire Valley Chateau," arrived on the open market this week with an asking price of $6,900,000. That's a vast sum of money by any standard but, according to property records and Your Mama's bejeweled abacus, it's also a significant $700,000 less than the $7,600,000 they paid for the 4.05 acre estate in December 2005. A long gated driveway rises to a sloping motor court that butts right up on the front façade of the 6,794 square foot residence, nestled into the hillside and built in 1988 with three fireplaces, front and rear staircases and–regrettably–a front-facing three-bay garage. There are 6 bedrooms and 9 full and 2 half bathrooms including staff quarters and a substantial second-floor master suite with sitting room, two-sided fireplace, dual bathrooms and walk-in closets and access to a long terrace that runs along the back of the Euro-elegant mansion. Main rooms in the center-hall mansion, according to listing information, include a sunken living room, dining room with glass-enclosed wine vault, library, media/music room, gourmet kitchen, family room, art studio and fitness room. 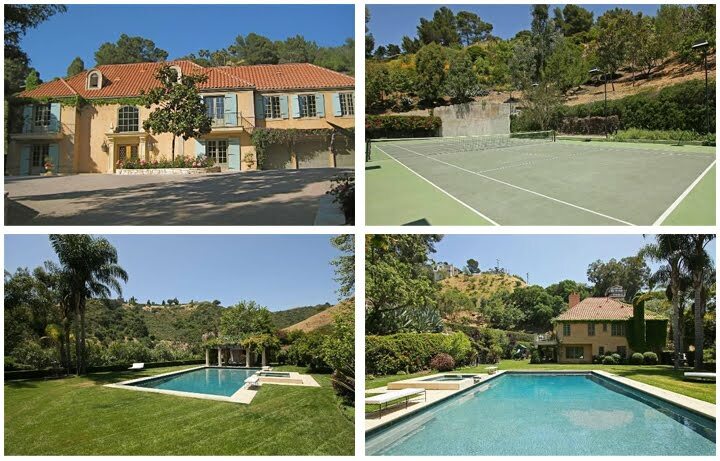 Miz Klum and Seal's new estate in the Brentwood Country Estates, which they bought out of foreclosure, sits on more than 8.5 acres and includes 8 bedrooms, 9.5 bathrooms, a cigar room with separate filtration system, wine vault and tasting room with antique floors and a domed library with a fireplace once installed in Napoleon's farmhouse. Some of the couple's new neighbors include Arnold Schwarzenegger. Maria Shriver has done moved out amid revelations that her husband sired an illegitimate child with a long-time household employee ten years ago. Before long Miz Klum will not the only foreign-born catwalk queen living up in the Brentwood Country Estates; Brazilian supermodel Gisele Bündchen and professional pigskin passer Tom Brady are in the final stages of the erection of a 22,000-ish square foot mansion. Miz Klum and Mister Seal are certainly no stranger to the celebrity real estate gossip columns. In June of 2008 Miz Klum sold a small penthouse apartment in the West Village for $5,350,000 and a couple years earlier, in February of 2006, the sold a very privately situated contemporary crib in the Beverly Hills Post Office area for $5,000,000 to boy bander Nick Lachey who currently has the property listed off-market with an asking price of $6,800,000. Those front-facing garages . . . whoever came up with that idea should be strung up. There are newer development streets in the Northeast burbs in which every house sports this eyesore. The only good thing about this disastrous economy is that said developments have had to stop in their ugly tracks, at least for now. Those eyeshadow blue exterior shutters have got to go. My eyes, my eyes! They surely bought this as a fixer upper.